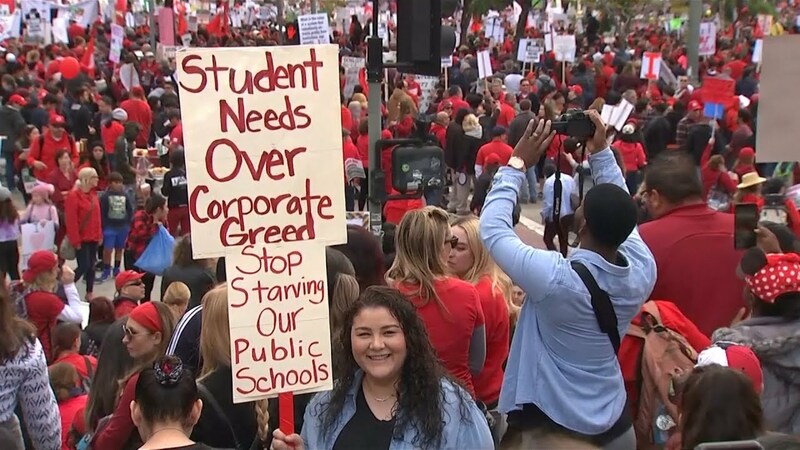 Denver teachers were set to strike today, but it looks like they may be delayed for a while. But don't worry. The people who staff the schools are gonna take care of everything. They plan to fill schools up, evidently, with just about anyone they can get to sub. It's very tough to be a sub, as far as I'm concerned. One of my least favorite things is getting called each semester for my freebie. I don't know any of the kids, and I likely as not don't know the subject either. There are a whole lot of subjects I'm not good at, and I've subbed in each and every one of them. Sometimes kids are reasonable and cooperative. Other times they aren't. I have things I use in my classes to make things go better. They work because the students know me and I know them. Sometimes we respect each other. Sometimes they know that I'll call their homes, report them to their coach, go to a teacher they really respect, or find some other way to make behavior inconvenient. When I sub, it's different. I just call the dean and get a kid or two removed. Hopefully that looks inconvenient enough to the rest of the class, and they will be reasonable. You never know, though. Now I'm certain there are subs who are better than I am, because I'm really not good at all. So on that basis alone, I have to respect people who come in and do this on a regular basis, or even an irregular basis. Still, I'm not sure the best sub on God's green earth could do what they're asking out in Denver. Let's just imagine you're a sub, walking into a school with not one teacher who's usually there, and having to deal with kids who know all their teachers are outside walking a picket line. I'm supposing their best hope would be that the students cut en masse. DPS is full of fine people. In fact, they even apologized after they threatened striking teachers with deportation. What more could anyone ask in terms of role models? As for budget, they're certainly focused on saving money, what with instigating a strike that will preclude paying any full-time teachers. I sure wouldn't want to be one of those "super subs," crossing a picket line consisting of my brother and sister teachers. Some people need the money. I don't know how much money you make selling hot dogs in Denver, but I guess when the dogs aren't moving, you stab unionists in the back and save the money to invest in sauerkraut for when it's finally in season again. The district says it's being very picky about who it hires. Sounds tough, huh? An on the spot interview with people absolutely desperate to fill positions. Maybe they hold a mirror in front of your mouth and check whether it mists up. Maybe they have stethoscopes to conclusively check for pulse. Furthermore, candidates are gonna need "training." How much? Who knows? But everyone needs to be trained by Monday, evidently. You can't just hire any scab. You have to hire trained scabs. It's really fine that the people who run Denver schools have no qualms about placing strike-breaking backstabbers in place as role models for children. A lot of administrators pretend to be principled, and to want the best for children. These administrators are fine with sub-standard conditions for working people, and for children. Kids under their tutelage can learn that school leaders think you take what you can get, and if you protest, screw you, you're fired. They can learn school leaders think their skills mean nothing, and they may as well be replaced by hot dog vendors straight off the street. Should the strike occur, the real teachers will be outside of school, standing up for themselves, and for the future of the children they serve. The administrators, who don't give a golly gosh darn about living conditions or learning conditions, ought to find jobs more suited to their talents. Maybe they can be robber barons. Or hot dog vendors. I sure hope no one I know buys hot dogs from them. You never know where people like that have been.